Taking Practice Violin Abroad, Is Customs a Problem? I have been working on a knock down practice violin for a few weeks now (ruining a few carbon bows in the process until I got one that I could successfully fold in half), and I just came up with another problem. Is there some certificate to tell customs that I made it and did not purchase it on the trip? I plan to put Knilling Perfection pegs and a Wittner Isny shoulder rest on it, so I really don’t want to leave it and I don’t to pay duty on it. I have provided a photo of the model I have been using for the build so you will have some idea what I am talking about. When disassembled, it goes into a 15”x4”x4” bag including the bow. Cool project... (almost tempted to say, "as usual") Irv! 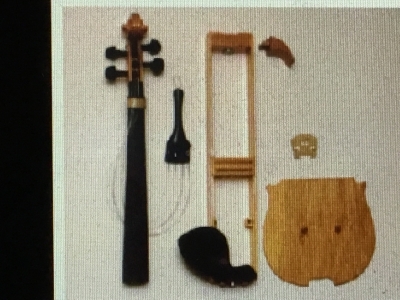 With all due respect, I don't think the customs agents anywhere will mistake it for one of those $450,000 violins that they reportedly seize on occasion. Hence, I personally wouldn't bother with a carnet ATA will will cost you over $200. For peace of mind, consider bringing along receipts for the parts you purchased in the USA (pegs, chinrest, shoulder rest) ...and have a great trip! Thank you, bocaholly. I could buy four more second hand violins for $200. @Irv - if you are travelling with it - it should not be an issue - get it scanned and labelled on the way out, should be seen as no more than part of your luggage. Hi BillyG. I purposely built it so that I could stow it in my luggage, so that should be no problem. I only bring up the issue because years ago I had a problem over an inexpensive Swiss graduation watch. All was approved when the customs representative noticed a small crack in the crystal. No idea why that made a difference to them, but it did. By the way - where are you heading off to, just out of interest ?